Channels TNT and TBS renew have renewed three of their top shows. Two freshman dramas Animal Kingdom and Wrecked from TNT and TBS respectively will be back for season 2 while TBS has also renewed Angie Tribeca for Season 3. Animal Kingdom attracts 6.7 million viewers over TNT platforms including things outside of TV like online etc. It attracts the youngest audience of TNT dramas and will be back with 10 episodes for season 2 in 2017. 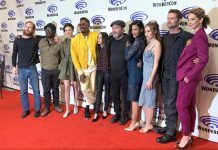 Wrecked garners 5.2 million viewers across all its services it can also count itself as on of the Top 25 cable scripted series for this year. The ensemble cast for the first season includes Asif Ali, Zach Cregger, Rhys Darby, Brooke Dillman, Ginger Gonzaga, Will Greenberg, Jessica Lowe, Ally Maki and Brian Sacca. It will be back in 2017. Angie Tribeca gets 2.6 million views and stars Rashida Jones, Hayes MacArthur, Jere Burns, Deon Cole, Andrée Vermeulen and Jagger. The show follows a squad of LAPD police and their misadventures.